Geosynthetic Clay Liners (GCL’s) are composites that combine geotextile outer layers with an inner layer of bentonite clay. 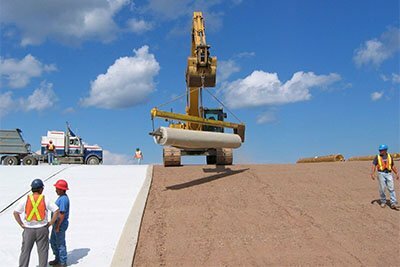 Typically, one geotextile is a non-woven geotextile while the other can be woven or non-woven. During fabrication of the GCL the bentonite is distributed evenly between the two geotextile layers and then they are needle-punched together. 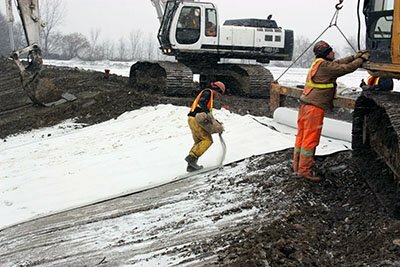 This process pulls fibers from the non-woven fabric through the bentonite to the other geotextile layer and keeps the bentonite in place. Bentonite is a natural sodium sealant which, when hydrated, will swell to create a low permeability liner offering approximately the same hydraulic protection as one metre of compacted clay. Replacing this thick clay liner with an easily deployed GCL can result in an increase in airspace, creating increased capacity and therefore more income for landfill operators.